WDC # 268. Page 2 - Lower half. Published original lower halfpage 2 from WDC # 268 ; "Christmas Cheers" from 1962. US-08 / 1954: "The Mysterious Unfinished Invention". Lower half page 16. Thanks to Jim from Minneapolis for selling me this historic half page - and for taking care of it for more than 25 years..! 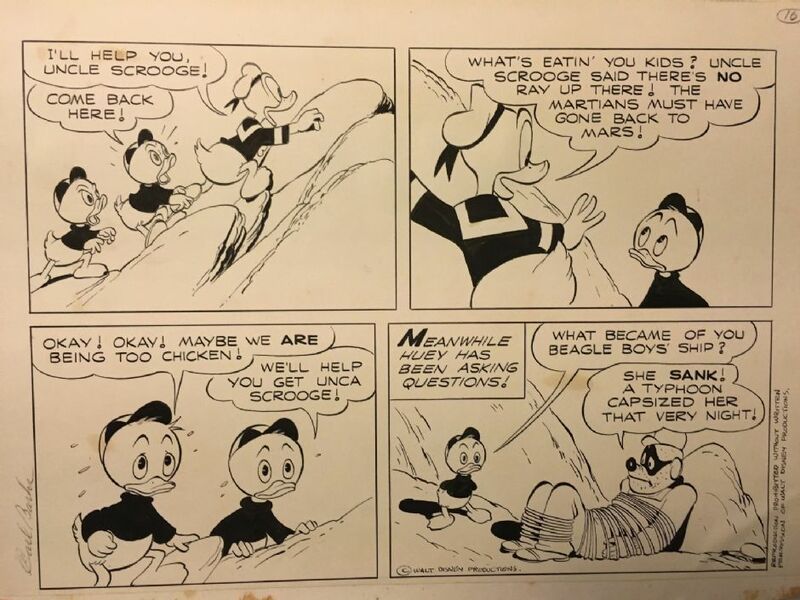 Isn`t the size of Carl Barks`original artwork just amazing..? WDC-175 / 1954 : "The Taffy Story". US-42 / 1962 : "Case of the Sticky Money". Page 2. Published artwork. Original artwork yellowned because of glued up on piece of wood, which was later removed. Published cover : US-312 / 1998. 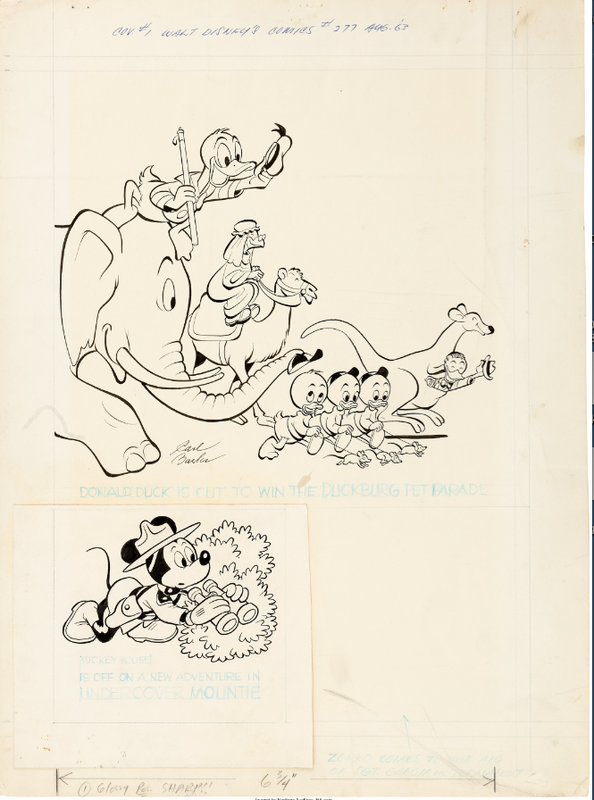 Pencil and ink : Carl Barks. Only survived artwork with Gladstone Gander and the densiest Barks cover ever known with 12 comic characters on it. 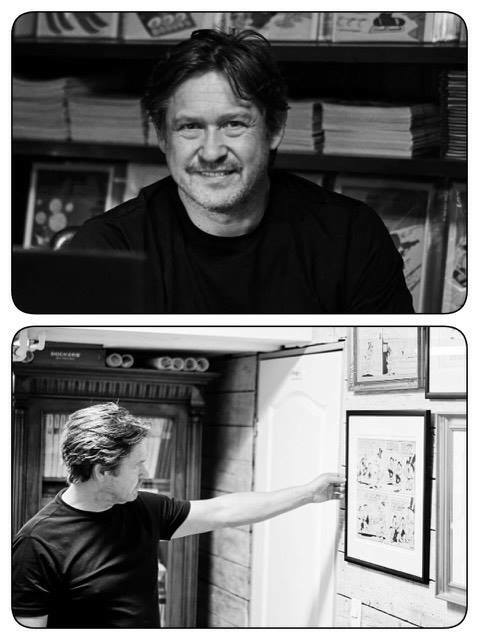 The Mickey Mouse drawing was made by Paul Murry. Missing piece in the right corner was a photo of Zorro. Preliminary sketch drawing from 1971 for the later oilpainting : "Blue Composition of Ducks". 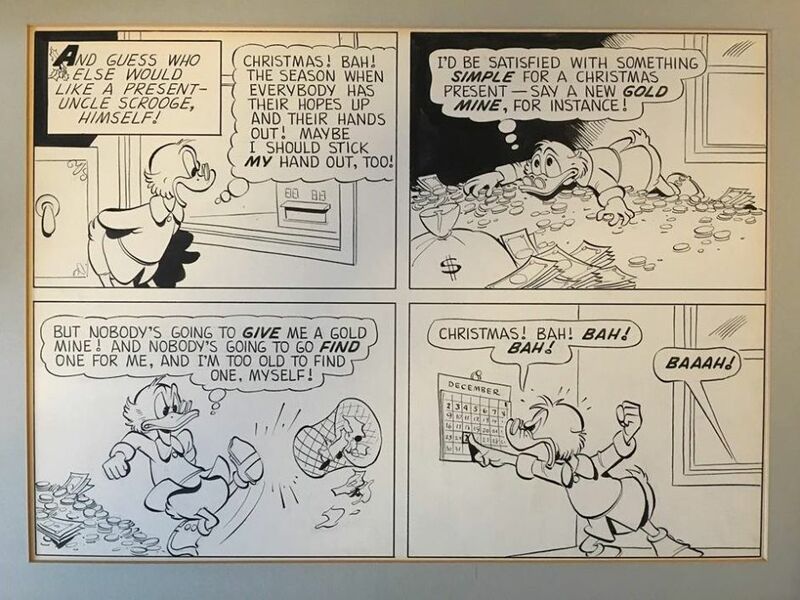 Notice that all of the comic characters on the sketch is only Barks own : Gladstone Gander, The Junior Woodchucks, Scrooge McDuck, Gyro Gearloose, Hexia De Trick and the Beagle Boy`s". Even the first dime and the Money Bin has found it`s place on this fine sketch drawing..
Worth to notice is that Barks painted Flintheart Gloomgold on the finished painting instead of Barko, the sleddog. 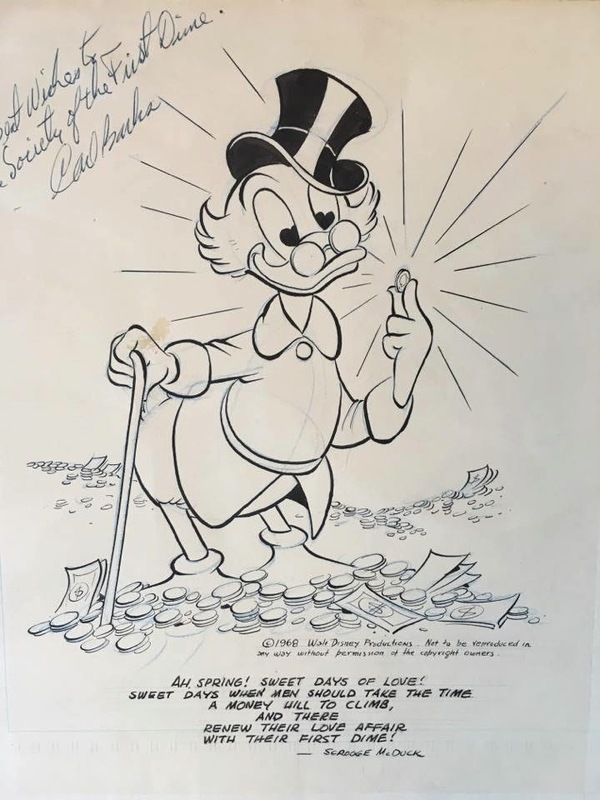 Portrait of Scrooge McDuck from 1968. 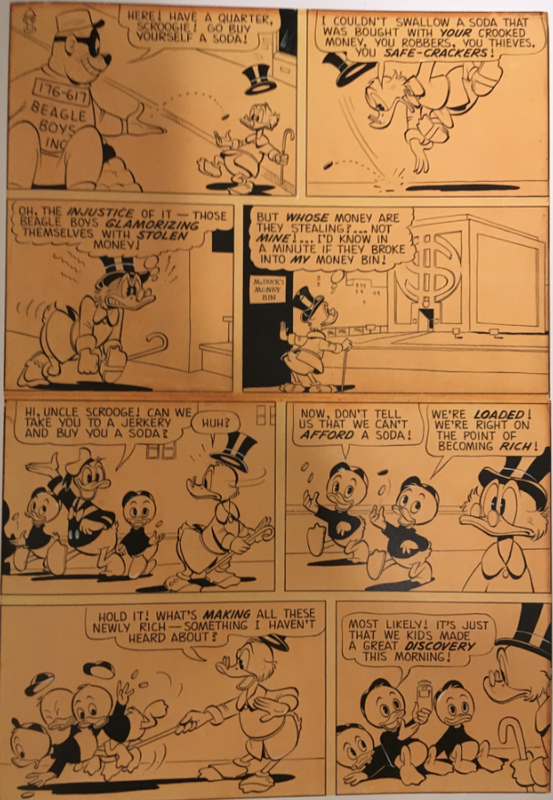 Drawn by Carl Barks for the 10 "Madisonians" on Wisconsin University when they established their club called "Society of the First Dime". 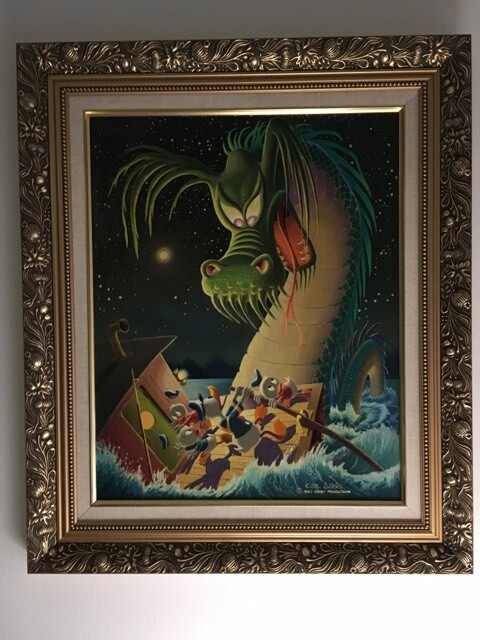 "Terror of the River" is an original Carl Barks oil painting on Masonite board from 1974 based on the legendary work of the beloved "Good Duck Artist." 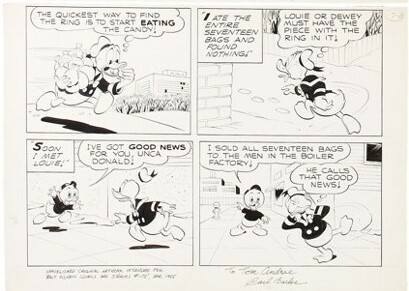 The painting is inspired by Barks' story for Four Color #108 (1946). It features Donald Duck and his nephews encountering an enormous sea monster. This is the only time Barks painted a scene based on Four Color #108, and it is unique in both mood and motion. It's well known that Barks painted multiple versions of several of his celebrated Duck paintings, but this one stands alone as the technical detail involved in creating it was intense and Barks felt that painting it once was enough! The painting is also known to be one of the most popular among fans of Barks' work. 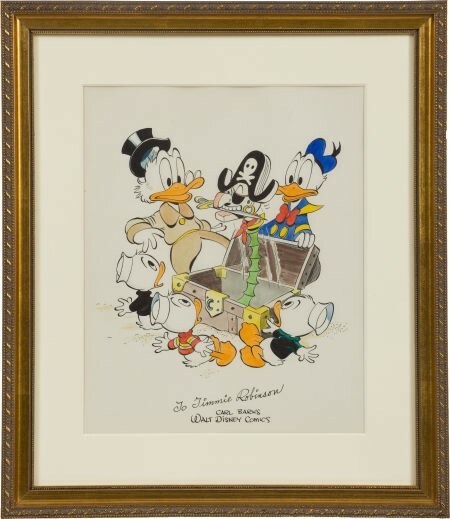 It was featured in the 1977-1978 Overstreet Price Guide in a special color section devoted to the best of Barks' Duck paintings. "Terror of the River" is a magnificent painting, primarily because of the action and lighting effects. ... Carl said he would never paint one like it again because it was so time consuming with the shading of the light of the moon and lanterns on the water and the immense detail involved in the water action. Commission drawing made in 1975 for a fan in Denmark.